To me this bread is the sacrament of the Sacred Divine of the Church of Gluten. My daughter would agree. The crumb is unbelievably tender and once you begin to partake of its holy sacrament, you can't stop. I've often baked this bread as a gift, and everyone said the same thing. You pull a corner and then there is this uneven shape which just won't do. In order to restore balance you pull on the offending corner. And then this imbalance thing happens again. This is the curse of braided bread. This curse also leads to an achy, overstuffed tummy. By the way, you MUST click on the image for a larger picture. I am not responsible for any drool damage to your electronic equipment. I found this recipe on a blog which in turn I found on foodgawker. The recipe is foolproof and I've never felt the need to tweak it. When I bake this wonderful bread I generally use King Arthur flour which truly is superlative. But I am a tad short on funds right now (the holidays tend to do that to me) and I am using regular store brand flour. In a standmixer with the paddle attachment place half of the lukewarm water, a tablespoon of honey, the yeast, and 1 of the seven cups of flour. Mix briefly. When the mixture starts to bubble (approx. 5 minutes), add the butter, remaining honey, beaten eggs, and remaining lukewarm water. Stir for a whirl and then exchange the paddle attachment with the dough hook. Now, cup by cup add the remaining flour while allowing the machine to mix and knead. This can be done with a spoon too, but I loooooove my standmixer as the dough is quite sticky. You may need to incorporate the last 1 cup of flour by hand with a dough scraper if you have been mixing by hand. Place the finished (sticky) dough into a slightly oiled 5 quart or larger lidded, food-grade container. Allow the dough to rise in the container until it collapses a bit. The top will be flat, no longer domed. Do put the lid but don't lock it in place. Now, invert the container onto your slightly floured work surface and divide the dough into four equal parts. If you don't want to bake four loaves, put the dough you wish to keep for later in individual ziplock baggies and freeze. If you are ready to bake, place the dough you wish to work with in your refrigerator and allow to cool for 20-30 minutes. It will be much easier to work with. 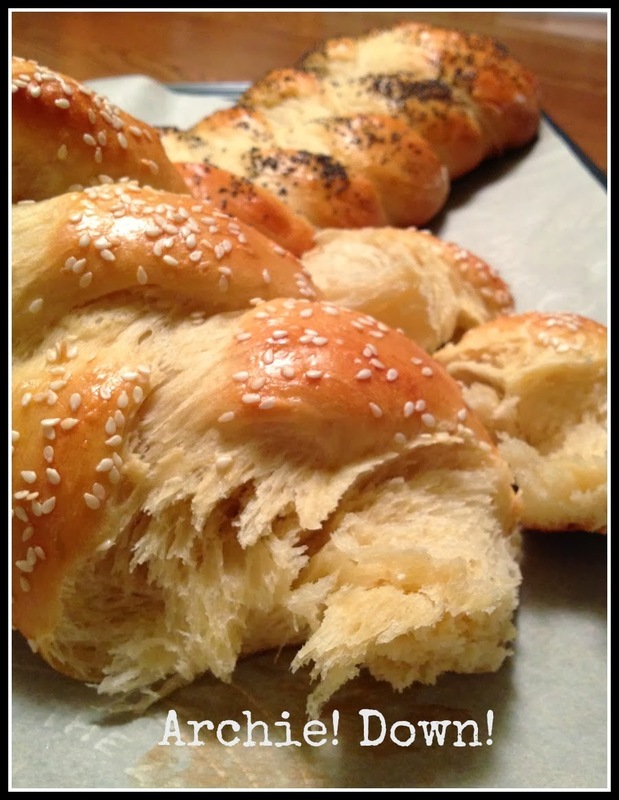 Divide each piece of dough into three pieces and roll into ropes. If the dough shrinks back, let rest for five minutes and try again. Braid the dough into a loaf starting at the middle. Turn around and braid the other side. Pinch and tuck the ends under. Transfer the loaves onto a parchment paper lined baking sheet and let rest at room temperature for about 40 minutes. I've found that covering them with a sheet of glad wrap helps prevent them from drying out. At the 40 minute mark turn on your oven to 350F. Beat the egg with 1 tablespoon of cold water and 'paint' the loaves with it. If you like sprinkle with poppy or sesame seeds. Bake for about 20-25 minutes in the middle of the oven. Remove and allow to cool on a rack. The procedure for the frozen dough is slightly different. Remove dough from freezer and allow to thaw in refrigerator. Cut into three pieces and allow to settle for 5 -10 minutes on the counter before making ropes. Let the braided loaves rest and rise for at least an hour before giving an egg wash and baking them.